SPECTREOUTREACH.com: Curing my bad luck away! Curing my bad luck away! To end my bad luck streak or emo . 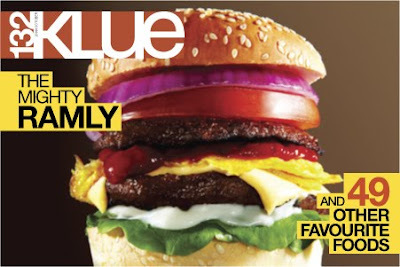 I decided to purchase The KLue magazine today * okay maybe the Big Ramli Burger Pix play huge role in enticing me* Gotta to be the best issue of Klue magazine I ever read. I learn that it just took RM 1 plus to makes a plate of nasi goreng ayam. swt -.-! Spec and many folk are getting ripped off on daily basis . sigh . Anyway, life must go.